A lot of people gaze admiringly at a Mahindra Thar when it passes by. At that very moment, many of them imagine buying one for themselves. Soon, reality takes over, and they decide to look at other cars. Why? It’s because they feel that the Thar can’t really be a great daily driver. Or they’ve been told that the Thar can never be the ‘only car’ in the garage. True, or untrue? We explain! A stock Thar is not comfortable for everyday use, especially if you’re used to a regular car and not a ‘jeep’. From the bumpy suspension to the constant flapping of the soft-top, it feels more like a four wheeled bike than a car. But the Thar can be made comfortable. For starters, the CRDe variant (that’s meant for personal car buyers) comes with a powerful air conditioner and a power steering. So, you’ll more or less be fine in the driver’s seat, and even in the co-passengers seat. Now, the other thing that the Thar really needs to become a comfortable vehicle for daily driving is aftermarket suspension. From Bilsteins to Amada, a range of aftermarket suspension makers offer shock absorbers that make the ride of the Thar less bumpy. Then you can also get the double d leaf springs at the rear to reduce both body roll and make the vehicle more stable at higher speeds. Finally, keeping tyre pressure at 28 instead of the recommended 32 also helps improve ride by quite a bit. With these changes, the overall ride quality of the Thar will be graetly improved, making it quite easy to live with on a day to day basis. Budget about Rs. 50,000 for Double D leaf springs and Amada suspension. Costlier options are available but this combination more or less gets the job done. If you need room for a couple and their dog, the Thar is nearly as perfect as it gets in stock form. But have a couple of more passengers to move? Then things can get quite dicey as the side-facing seats aren’t for everyone, especially on longer drives. The other thing that can make the Thar tiresome is the constant flapping of the soft top. But again, the Thar can be made practical for everyday use, so much so that it can actually be your only car! All you need is front facing, fold-able seats from the older Toyota Innova. Swap the side facing benches with these seats, and the Thar can seat four adults comfortably. To make it quieter, you need a hard top. There are a range of options available from the aftermarket, from fiber tops to all-steel ones. These changes will really transform the way the Thar feels while driving, and are well worth it it don’t fancy getting the top down in the pleasant months. Having a hard top also gives you a cabin that’s safe for carrying luggage, and also the option of installing a music system. Budget about Rs. 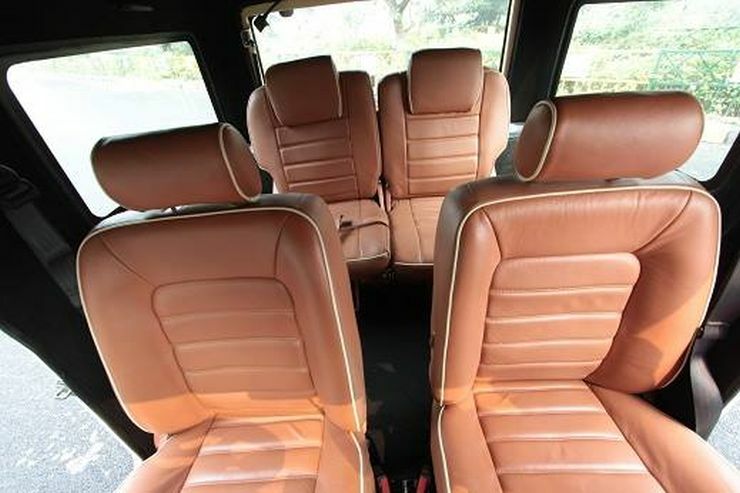 8,000 for Innova seats and Rs. 40,000 to 1 lakh for a hard top (depending on what you choose). Not really. There’s a limit to the aftermarket modifications that can be done on the Thar. You can’t add ABS or airbags. A child seat can be added with some modifications. And a roll cage, either internal or external can also be added. But more or less, the biggest safety feature in the Thar is you, and your common sense. Drive under the speed limit and defensively, you’ll be just fine. Add Rs. 25,000 for a good external roll-bar. Instead of all these modifications, why not buy the Scorpi0 S4 4X4? Well, do you really take a second glance when a Scorpio passes by? If so, yes, the Scorpio 4X4 with ABS and Airbags may just be the vehicle for you. It’ll take you almost everywhere the Thar 4X4 does, and in more comfort. It’s not too expensive either but then it may never really tug at your heart the way the Thar does. It’s a Jeep thing, and you live only once.